After the gluttonous consumption of last week's feast and the deep fried croquettes for leftovers, I should probably take a healthy break before the onslaught of holiday goodies. 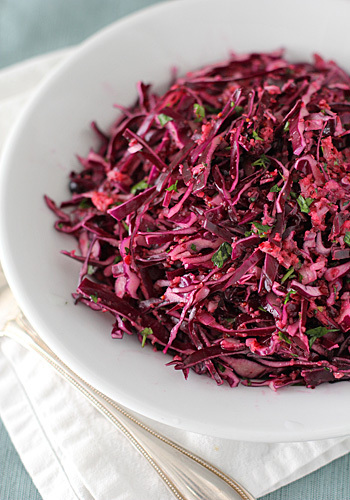 Light, but full of flavor, this is a seasonal slaw that tastes great and comes together quickly. Fresh cranberries are puréed to form the base of the vinaigrette. Maple syrup (the real stuff, please) is added for sweetness while minced shallots are added for a mild onion flavor. A little parsley is tossed in the mix for some color and additional fresh flavor. The only hard part of this recipe is letting the slaw rest in the refrigerator to allow the flavors to blend. After a few hours it's good, but if left to age overnight it's even better. In the bowl of a food processor, combine the cranberries, maple syrup, red wine vinegar, and olive oil. Purée until smooth. Scrape down the sides of the bowl and process again. Transfer the vinaigrette to a small bowl and stir in the shallots and parsley. 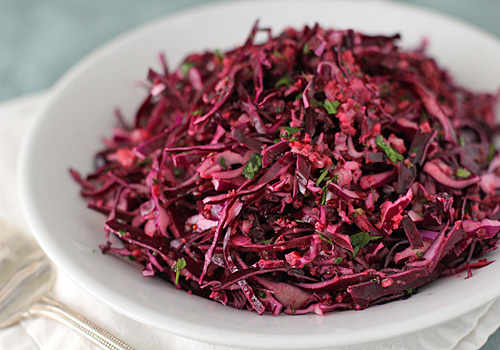 Toss the vinaigrette with the red cabbage. Season to taste with salt and pepper. Cover and refrigerate for several hours or overnight to allow the flavors to blend. Enjoy! Cranberry vinaigrette -- I'm totally digging this! I have a whole bag and a half in the fridge and I've been popping them like candy or throwing into pancakes and oatmeal, but I love this savory use. I'll be trying this over the weekend.